The Nuclear Non-Proliferation Treaty created a framework for limiting the spread of nuclear weapons with a view to disarmament. However, nuclear-states have been developing their arsenals and technologies rather than reducing them. Since March 2013, when the first of three international conferences on the humanitarian effects of nuclear weapons was held, a path to full nuclear disarmament in the form of a ban treaty has emerged. On 27 October 2016, the First Committee of the UN General Assembly adopted resolution L.41 to convene negotiations in 2017 on a “legally binding instrument to prohibit nuclear weapons, leading towards their total elimination”. 123 nations voted in favour with only 38 against and 16 abstentions. Then, in December, the General Assembly agreed to convene negotiations in March for a treaty prohibiting nuclear weapons where again a significant majority of 113 nations voted in favour. Australia’s position in the lead up to the negotiations is regrettable. The government announced its decision to boycott however, this has not come without backlash as public opinion and division of parliament shows this issue is not clear cut. Australia’s defence doctrine includes the notion of protection from America’s ‘extended nuclear umbrella’ and so the government has supported its position that a total ban on nuclear weapons is not the most effective way to achieve disarmament nor is it in our national interest to partake. This leaves Australia isolated as the entirety of the Pacific region supports the ban. Since Monday when negotiations began in New York, Penny Wong the Shadow Minister for Foreign Affairs has released a statement demanding an explanation regarding the government’s position and highlighting the strong global commitment to a ban. 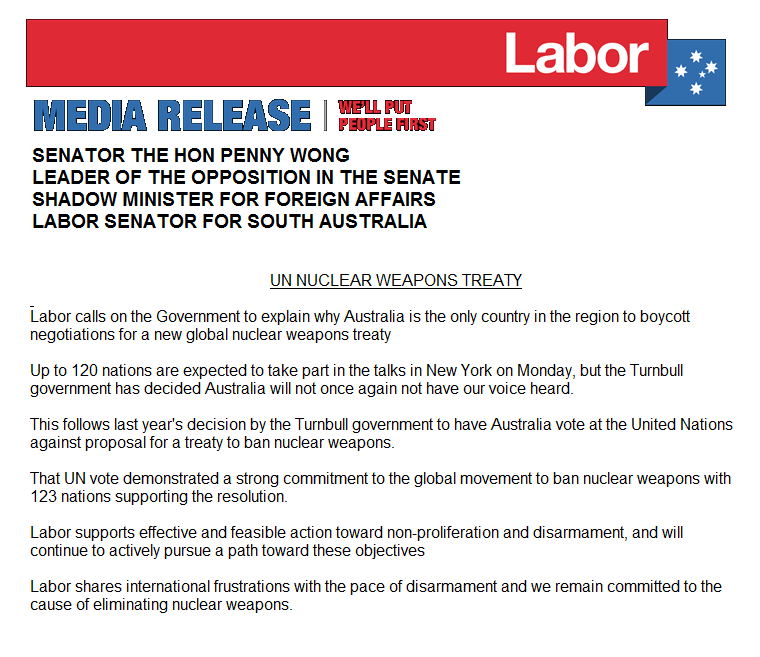 Labor supports action towards disarmament and in fact, under the Non-Proliferation Treaty we are obliged to engage in processes leading to disarmament. SafeGround made a submission to the Australian Defense White paper which included recommendations to participate in the negotiations. On the first day of the negotiations Senators Singh and Ludlam proposed a motion urging the government to participate in the nuclear ban treaty which was passed. As the week continues we hope the impetus grows in strength domestically, while internationally agreement and progress is reached. SafeGround calls upon the Australian Government to openly and unequivocally support negotiations towards a total ban on nuclear weapons.